To catch the audience: with a virtuosic dialogue between the very different timbres of the clarinet, cello, and piano; through the joy of making music together; through searching tirelessly for a shared sound. This is what makes Trio Catch stand out. Boglárka Pecze (clarinet), Eva Boesch (cello) and Sun-Young Nam (piano) met during scholarships at the International Ensemble Modern Academy in Frankfurt, after which they formed Trio Catch, named after “Catch” by Thomas Adès, in which the clarinet is “caught” by a piano trio that plays a charming children’s round. Alongside performing classical music, the interpretation of contemporary music is one of the main focuses of their collaboration. 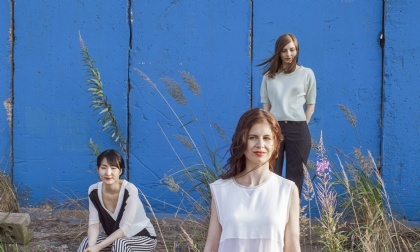 The Hamburg-based trio have worked with numerous composers during their five years together, including Mark Andre, Georges Aperghis, Beat Furrer and Helmut Lachenmann, with whom they are also connected by various CD productions and radio recording projects. The trio won the Gotthard Schierse Foundation concert award in Berlin in 2011, the Hermann and Milena Ebel prize in 2012 and was awarded with the Berenberg Kulturpreis in 2014. A busy schedule has already seen Trio Catch playing concerts in Germany, France, Austria, Spain, the Benelux countries and Switzerland as well as at festivals such as the Darmstadt International Summer Course for New Music, Ultraschall Berlin, Tage für Neue Musik Zurich and the Wittener Tage für neue Kammermusik. They are also on tour in the 2015/16 season, playing at some of the greatest concert halls in Europe as part of the European Concert Halls Organisation’s “Rising Stars” series. Trio Catch are involved in music education, running the children’s composition workshop “Louder” at Klangspuren Schwaz, and workshops for students of composition as the Musikhochschule Hamburg’s ensemble in residence, as well as performing in schools around Hamburg as part of the JeKi (an instrument for every child) concept. They have also held a teaching post at the Musikhochschule Hamburg since the summer semester of 2014. “Trio Catch are like a fresh new brand for the old lady New Music.” (﻿www.vanmagazin.com) — Could there be a catchier way of phrasing it?